In this brief, the Center for American Progress aims to give the public a sense of the radical nature of the unilateral action the Trump administration is planning. To do so, the authors estimate what would happen if all people in the United States—U.S.-born citizens and immigrants alike—had to take this “Trump test,” based on the most recently leaked draft of the rule.3 According to CAP’s estimates, the proposed Trump test is so restrictive that more than 100 million people—about one-third of the U.S. population—would fail if they were required to take it today. In short, the Trump test is not just a radical attempt to unilaterally and fundamentally rewrite federal law, it is also the latest iteration of discredited conservative attempts to label working-class Americans as “takers” rather than “makers.” The GOP-controlled House recently voted to reject legislation that would have imposed harsh restrictions on family- and diversity-based legal immigration.5 The administration should follow suit and discontinue its plan to impose similarly harsh restrictions unilaterally. Under the most recently leaked version of the draft regulation, the current definition of public charge would expand to include anyone who receives or is considered likely to receive “any government assistance in the form of cash, checks or other forms of money transfers, or instruments and non-cash government assistance in the form of aid, services, or other relief, that is means-tested or intended to help the individual meet basic living requirements.”15 As the table below shows, this includes both a long list of benefits and services that are explicitly named in the draft regulation as making someone a public charge as well as additional benefits that seem to be implicitly included. Nearly all of the additional benefits that are considered by the Trump test are ones that employed people with no health conditions are eligible to receive as long as they meet any income, asset, and categorical requirements. As a result, one of the most radical aspects of the Trump test is that it would treat employed people as public charges. In addition to these explicit factors, the rule also gives DHS the authority to heavily weigh—both positively and negatively—any other “factors, as warranted, in the discretion of DHS, in individual circumstances.”20 As a practical matter, this means that DHS has nearly unbounded discretion to decide whether to pass or fail someone taking the Trump test. People who live in households with combined income and assets of less than 250 percent of the federal poverty guidelines and thus would be considered public charges based on income and assets alone. The authors estimate that this demographic accounts for a little more than 25 percent of the U.S. population. People not included above—individuals who live in households with combined income and assets of 250 percent or more of federal poverty guidelines—who live in households in which someone has a medical condition and no one has unsubsidized health care.22 The authors estimate that an additional 6 percent of the U.S. population falls into this category. As a result, the number of people who pass the Trump test today but fail it tomorrow would increase over time. While, in this brief, the authors do not estimate an upper bound for Trump test failures, it is reasonable to assume that half or more of all people in the United States could fail it over a longer-term period. Finally, while the focus of this brief is on the income, financial asset, resources, and health factors that are heavily weighted in the Trump test, analyses of current receipt of means-tested social assistance by DHS and the Migration Policy Institute provide further perspective on the radical scope of this test. In the draft rule, DHS estimates that 69 million people—about 22 percent of the U.S. population—received one or more of the following six benefits: Medicaid; Supplemental Nutrition Assistance (SNAP); Special Supplemental Nutrition for Women, Infants, and Children (WIC); public housing; rental assistance; or Low Income Home Energy Assistance (LIHEAP). Notably, DHS also finds that a substantial number of people with incomes of more than 250 percent of the federal poverty line receive these benefits. For example, it estimates that nearly 10 million people in families with incomes of more than 250 percent of the federal poverty line receive at least one of these mean-tested, in-kind benefits.26 The overwhelming majority of these 10 million are native-born U.S. citizens. The Migration Policy Institute recently estimated that about 3 percent of the U.S.-born population receives benefits that could be considered in a public charge test under the current long-standing policy.28 It then estimated how much this would increase based on just adding SNAP, Medicaid, and the State Children’s Health Insurance Program (SCHIP) to the test—simply adding these three programs would increase this percentage from 3 percent to 32 percent, a more than tenfold increase. Trump’s public charge test would make it impossible for most working-class immigrants seeking green cards through the family- and diversity-based immigration processes to legally come to the United States. Requiring immigrants to have the inherited wealth of President Trump’s son-in-law, Jared Kushner, for example, or the education necessary to work a high-tech job in Silicon Valley means that they will need to have already achieved the American dream before even stepping foot on U.S. shores. Moreover, by narrowing the legal channels to family reunification, the Trump test could increase undocumented immigration. 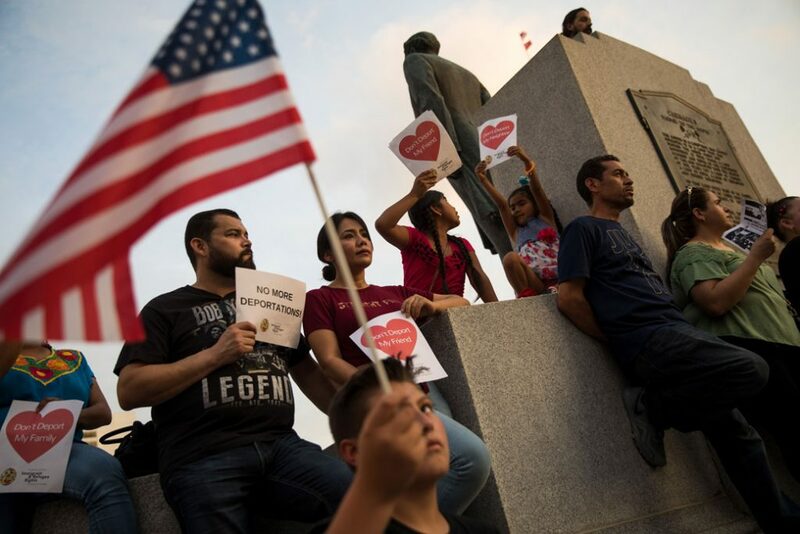 President Trump may claim to be for working-class people, but his policies reveal a disdain for them and a complete dismissal of the contributions that generations of immigrants who arrived in this country with few or no resources have brought to America. Melissa Boteach is the senior vice president for the Poverty to Prosperity Program at the Center for American Progress. Shawn Fremstad is a senior fellow at the Center. Katherine Gallagher Robbins is the director of policy for the Poverty to Prosperity Program at the Center. Heidi Schultheis is a policy analyst for the Poverty to Prosperity Program at the Center. Rachel West is the director of research for the Poverty to Prosperity Program at the Center. The authors are deeply grateful to Christian E. Weller for his expert advice and analysis; Eliza I. Schultz for her research assistance; and Emily Gee and Philip E. Wolgin for their review. The authors use this information to estimate how many households fall below this threshold and then multiply this number by the average household size for households that fail the income and assets test in order to estimate how many people in the United States fail the Trump test based on this factor alone. By the authors’ estimates, about one-quarter of people in the United States live in households with combined income and assets of less than 250 percent of the FPG and thus would be considered a public charge based on income and assets alone. Based on this analysis, the authors estimate that an additional 6 percent of people live in households in which someone has a medical condition and no one has unsubsidized health care. In total, the results suggest that about 32 percent of all people in the United States live in households that are below the income and assets threshold or include someone with a medical condition and lack unsubsidized health coverage. This figure is a conservative estimate in a number of ways. First, as noted in the text, because this estimate represents a single point in time, it does not account for fluctuations in income, assets, or health conditions over time. 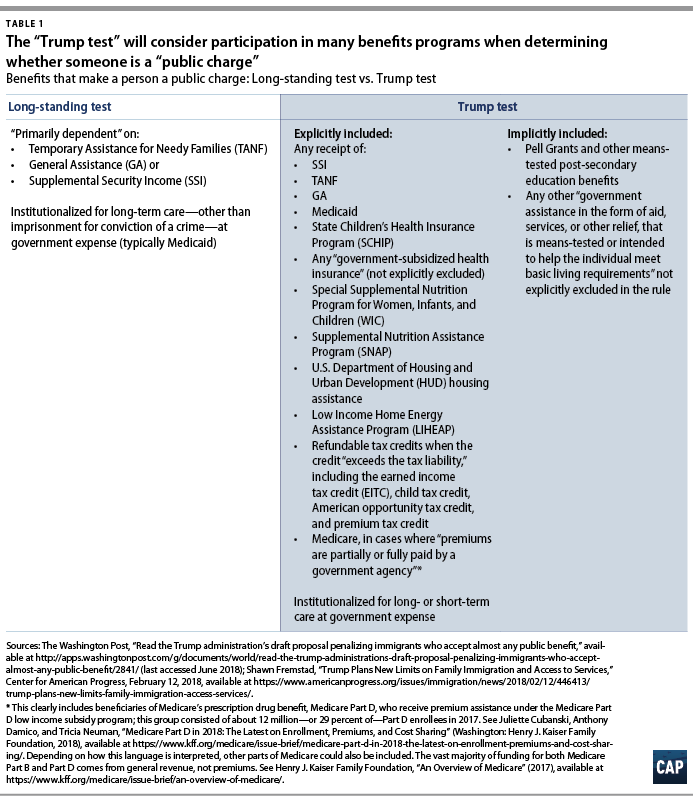 Both the current public charge test and the Trump version of the test assess whether individuals are likely to become a public charge at any time in the future based on their current demographics and circumstances. The second way in which the authors are conservative is how they estimate the likelihood of someone in a household having a medical condition. Due to data limitations, the authors first look at the likelihood, based on the age of the head of the household, that the household includes someone with a pre-existing condition; they then conservatively assume that any other individuals in the household have a very low probability of having a pre-existing condition—specifically 6 percent, which is the likelihood that someone under age 18 has a pre-existing condition. Assuming the other people in the household have an average chance for a nonelderly person of having a pre-existing condition, the overall figure would rise from 32 percent to 35 percent. Additionally, while, in many instances, the householder will be the oldest person in the household and thus the most likely to have a pre-existing condition, in the instances in which there is another older person in the home, this method of estimation does not account for the person in the home who is most likely to have a pre-existing condition. Third, the question regarding health insurance in the SCF asks whether any person in the household is covered by a public or private health plan, not whether each person is covered or not, so the authors’ approach assigns employer- or union-provided coverage—used here as a proxy for unsubsidized care—to the whole household, even if some members are not covered. It also means that some members of the household may be covered by a subsidized plan, which is not captured here. This likely overestimates the extent of unsubsidized health insurance coverage in the household, which will produce a conservative estimate of those likely to become a public charge.